This is 6 of 10 graphic design mistakes business owners make and how to fix them. Why it’s bad: There’s a reason disclaimers are in 6pt type. No one reads them! 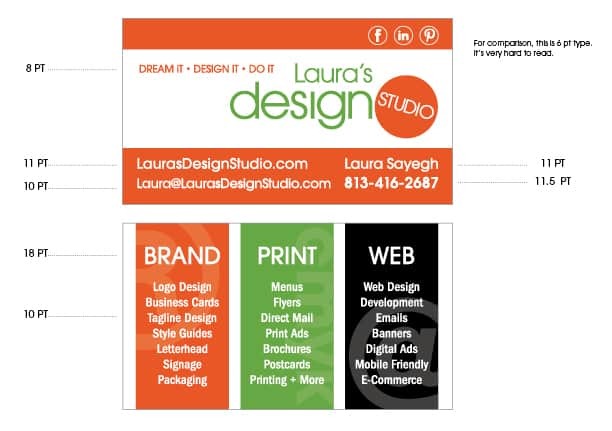 If you want people to read your business card, then make sure your content is big enough to be clearly legible. How to fix it: Remember, the whole point of your business card is to get potential clients to call, email, or go to your web site. They can only do this if they can easily read the information on your card (or other print material for that matter). For best results, make sure your font is 8 to 10pt type depending on the font. If you serve an older population, you may want to go even bigger. Sample business card font size. As you see the 6pt font is hard to see.